Many companies measure and track customer satisfaction via Net Promoter Score or another type of satisfaction instrument. While these tools are effective at determining satisfaction levels and tracking changes over time, they typically do not identify what is actually driving customer satisfaction. We often use Kano analysis to reveal those drivers. It considers both the combination and interaction of product/program attributes in addition to examining each attribute separately. 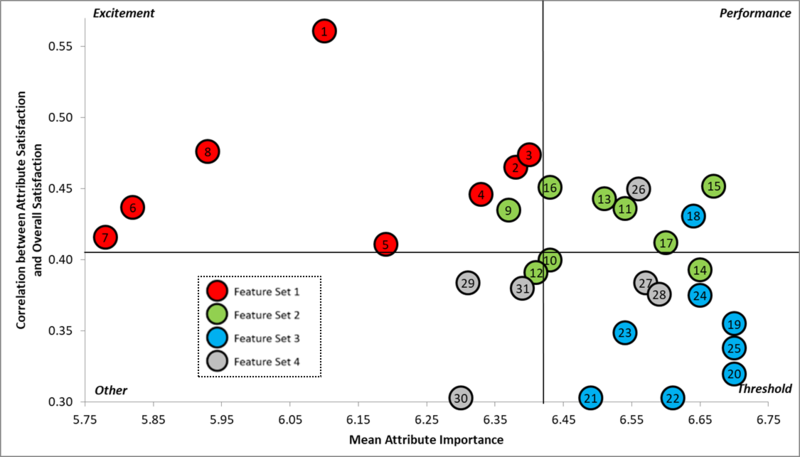 Using correlation analysis to establish the connection between individual attributes and customers’ overall satisfaction, we are able to plot derived importance and current satisfaction for each attribute. Each measured attribute of a product or company can be plotted and will fall into a quadrant on the data plot. Three of the quadrants are of note: Threshold, Performance, and Excitement. For each attribute, direct importance is rated. For each attribute, motivational importance is derived from overall satisfaction and the satisfaction level for that attribute. Direct and motivational importance are plotted on a bivariate graph. What do the quadrants mean? Threshold attributes are the basic expectations for a product or service. For example, a car buyer would expect the car to have brakes. If they are functional brakes, nothing more is needed and extra features won’t return a higher level of satisfaction. If a company performs poorly on a threshold attribute, however, it needs to be addressed immediately as meeting threshold attributes is required to be a viable option for buyers in a market. Inadequacy can drastically reduce overall satisfaction. Proficiency is required to even begin to be in the consideration set of buyers. Mastery tends to greatly increase overall satisfaction. An example of a performance attribute would be gas mileage on a car. The higher the gas mileage, the more satisfied the customer and the better he/she feels about owning the vehicle. In other words, with performance attributes, more is better. In our real-world example, you can see there are attributes from feature sets 2, 3, and 4 that are performance attributes. This gave the client great insight about where to focus attention on improvements, especially for those attributes that had a qualifying gap in satisfaction. Performance attributes can provide direction for marketing strategy, too, particularly if you gain Kano results for key competitors and not just your customers. Excitement attributes are “unexpected delights” to consumers. Inadequacy does little to decrease overall satisfaction. An example of an excitement attribute would be a heated driver’s seat. It’s not an expectation of most drivers, but it is a nice bonus to the experience that the car owner appreciates when it’s present. Often, over time, an excitement attribute will become a threshold attribute if the industry adopts it. In our real-world example, you can see that all of the attributes from feature set 1 were excitement attributes. Our client chose to focus on these attributes going forward to help increase their customer’s overall satisfaction. A hospital system learned that its birthing services patients had different expectations than the patients at its main competitor, and also that it outperformed its competitor in several performance attributes – it used the results to guide updates in marketing messaging to patients and prospects. A supermarket learned that it had issues with its customers’ experiences during check-out, but also that it had a distinct advantage over its main competitor in how it operated that was valued by consumers – it used the data to change POS systems and make other customer experience changes as well as promote the operational advantage more in its marketing. 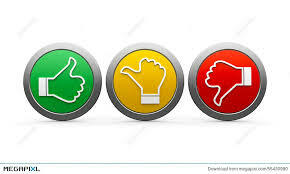 A financial services provider learned that different attributes drove the satisfaction of its primary customers and secondary customers, and that satisfaction levels varied significantly – the data was shared with sales managers, and a new initiative aimed at secondary customers was developed. Investing the time and funds to conduct a full scientific Kano analysis can pay back in many ways. Improvement: Identifying where the biggest gains can be made in your own customers’ satisfaction. Opportunity: Identifying where your prospective customers are least satisfied with competitors. If you’d like to know more about Kano analysis, reach out to Linda Kuster (lkuster@vernonresearch.com) or Andrew Juhl (ajuhl@vernonresearch.com).